Great Opportunity to own a turn Key Business at desirable Sawgrass Mills Mall. 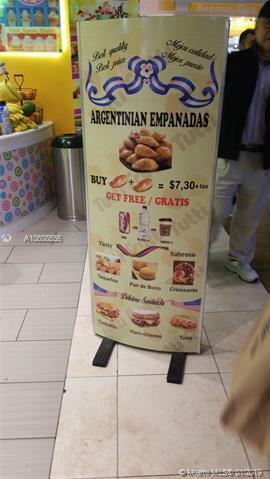 Yogurt Ice cream, cafeteria with excellent variety of product that include famous Argentinians Empanadas. Great clients ..Great Location..great income. Good business to apply for a E2 INVESTMENT VISA., this wont last long, motivated seller. NDA must be signed before more information provided, 24 hrs showing NOTICE.